Concrete Chiropractor has repaired hundreds pool decks during the last 17 years. We hope some of these friendly tips may help you avoid costly repairs to your in ground pool in the short term, along with years to come. Be sure to correct any settled concrete around your pool which can divert rain water toward your pool & coping. The water will freeze in the winter months. This can result in popped tile, coping or even liner damage. 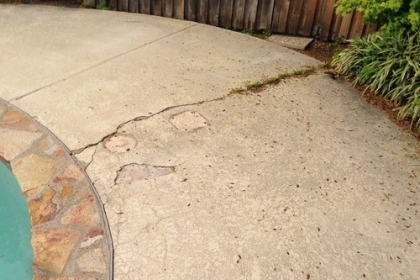 Also, if your concrete develops voids or is not properly supported, animals can take up residence in these voids, or your concrete deck may crack and drop causing damage in need of costly replacement. Caulk all open joints. Especially near any pool coping to prevent the above mentioned rain water from entering the joints resulting in damage. For joint sealing, contact a pool renovation or repair company. If your pool appears to be losing water at an unusually fast rate, you may have a leak in a pool line or the pool itself. This can cause further damage to your pool or concrete deck. If you suspect a leak, contact a pool repair company that can test for and repair the leak. It’s Almost Pool Season: Is Your Pool Deck Safe? Subscribe now and get the latest updates!